Lilac Wine certainly lives up to its name. 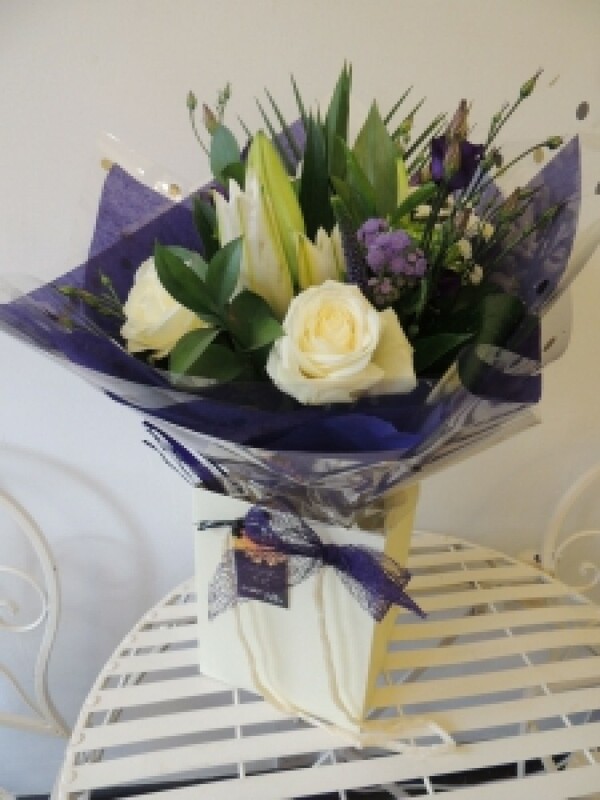 This arrangement is truly special and includes white avalanche roses, stunning purple lisianthus and white lilies all hand tied with beautiful greenery and palm leaves to frame the gorgeous bouquet of flowers. The arrangement is surrounded by purple tissue and cellophane and presented to the recipient in a cream floral bag ready for them to enjoy for days to come. We are open from 9.30am until 4.00pm Mon-Tues , 9.30am until 5.00pm Wed-Fri and 9.30m-3.00pm on Saturday. If you would like to discuss your order on a more personal basis over the phone please dont hesitate to contact us on 0114 235 9909.